Well friends, I've been a busy bee (about as busy as one can be while horizontal & exhausted most of the time). Something came over me and I decided to write the pattern for this tote. This is such a simple bag to put together, I had to share. 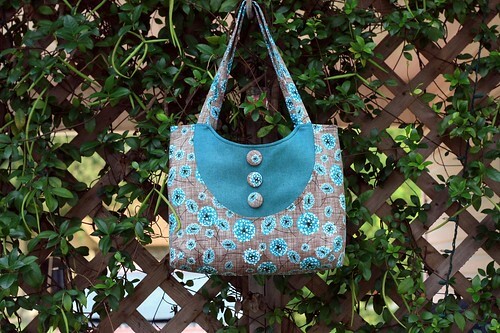 Just like the bag itself, the pattern writing came together easily. The hardest part was taking photos. Oh those photos! They kill me every time. It doesn't help that my patio, my usual backdrop, is not looking so great these days. All my plants are crispy and withered and I have little desire to make it better, not until a little cool front comes through and it starts to feel like fall. Once that happens, I'm sure I'll be on the hunt for some mums & pumpkins to brighten up the spot (can't wait for that! )....and a fire pit. Yes, we need a fire pit!! And some new cushions! And a spiffy outdoor rug! Sorry, I got a little carried away there. Back to the Daphne Tote. Like I said, she's a simple one to put together, perfect for a beginner or someone who doesn't like to make complicated things (that would be ME). 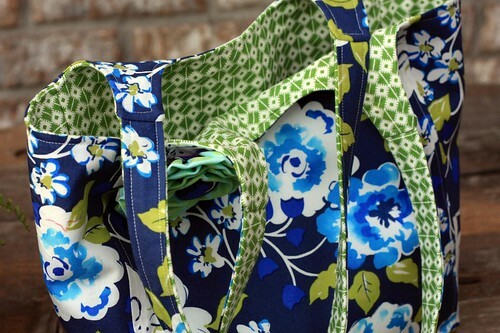 The trickiest part is not sewing your straps into the seam when you're attaching the bag to the lining, but with enough pins to keep things in place, you should be fine. 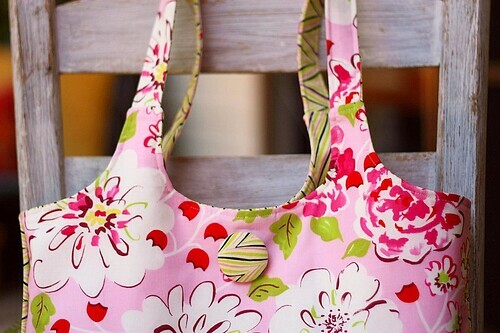 To make this bag you'll need about 3/4 yard of your favorite fabric for the exterior, 1 yard of another favorite coordinating fabric for the lining, some interfacing of choice (I've been using cotton duck canvas lately), a magnetic snap if you choose, a pretty button for the front, and if you want to get really wild, some piping or other trim for the seam of the bag. I included simple instructions for adding piping if you want to. Gosh, I'm really into that piping right now. I'd like to try some jumbo ric rac or maybe a small ruffle at some point. 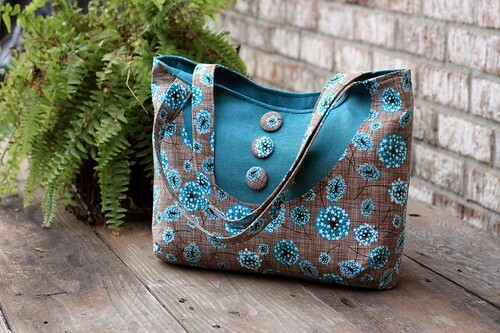 She's a roomy bag (13.5" wide x 10" tall x 4" deep) - not too big, not too small, my favorite kind of bag to carry. Big enough for all the essentials plus a knitting project or some hand sewing. You know me, I always carry some kind of project with me. There are no fussy pockets, just a simple slip pocket or two if you'd like. 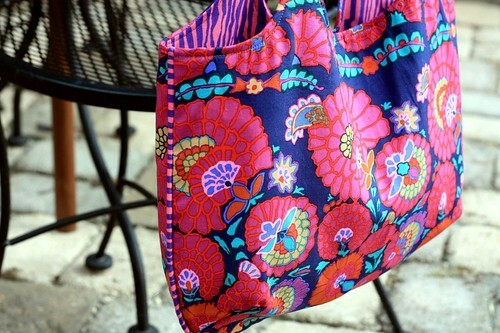 If you'd like to give her a try, the Daphne Tote is available for sale in my shop. Happy sewing! 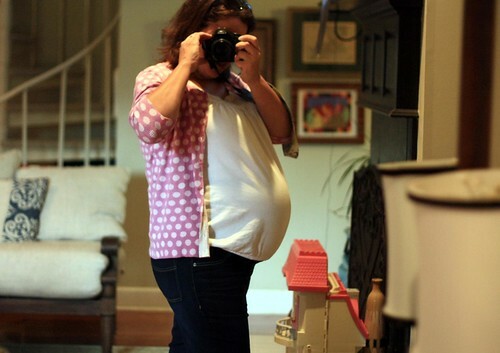 Well, here I am, nearing the end, getting larger by the day. In some ways it feels like I've been pregnant forever (Feb seems like so long ago) and 2 months still seems quite far away, but I know that it will be here before I know it. I think I'm still in a bit of denial. I am not one to slow down, but this pregnancy has put me to an almost sceeching halt. Never before have I felt so physically and mentally exhausted. The usual response when I mention this is "well, you have 3 kids to look after", but that's not it. Yes, I have 3 kids to look after, but they're all old enough to do for themselves. There are no diapers to change, mouths to feed, or little bodies to bathe like the last time I did this. If I wanted, I could bark out orders from my sofa, never lifting a finger. In fact, many days when we all get home in the afternoon I go into my room for a little nap. That little nap helps a lot. Perhaps some of my mental fatigue is my own fault. I feel guilty for not being able to do more...and I HATE having to depend on others. I want to do more, and I hold dear those things which I can still do, like waking the kids up in the morning and picking them up from school. I used to hate picking them up from school, but now it's my favorite part of the day. I love seeing them run out out to greet me and the conversations we have on the way home. Health-wise, this may be one of my healthiest pregnancies. I have no aches to complain about, my swelling has been minimal, and I don't have gestational diabetes. That last one was a shocker considering that I had it with my last two. I'm also very surprised that my swelling hasn't been more severe, especially in this heat (my GOD, the heat!!). My ankles are just now starting to disappear at the end of the day, but overall it hasn't been too bad. I think the worst swelling has been in my face (lovely ;-)) Sometimes when I look in the mirror I barely recognize myself. 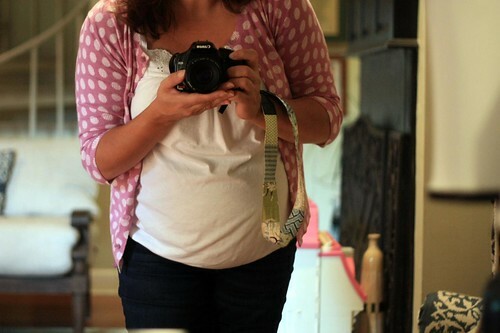 Getting dressed in the morning has become more of a challenge, as most of my maternity tops no longer cover my belly. At this point in the game I'm not adding to my wardrobe, so I'll just have to make do. As much as I've not "enjoyed" this pregnancy (i've never enjoyed ANY pregnancy), I do know that it is all worth it. I am blessed. Once this little girl makes her debut, I'm sure we won't be able to imagine our lives without her! All this revisiting the past with my patterns has gotten my wheels turning. I'm having a hard time keeping my brain on track with my old stuff (only 1 more pattern to re-make!!) when new designs keep popping into my head! After getting my "work" done this weekend, I gave in. What resulted was 2 new designs, both of which I'm rather fond of. A few weeks ago I mentioned making new dance bags for my girls. 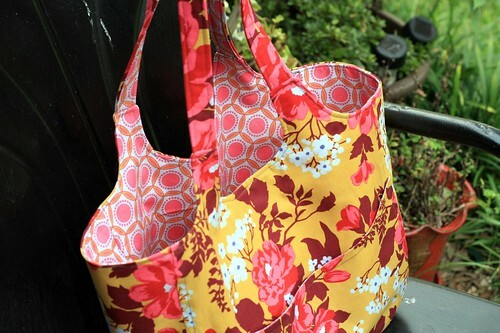 The easy route would have been to make them each a simple tote or use a pattern that I already have. You should know by now that I like to complicate things. Neither of those options seemed quite right, so I came up with something new. 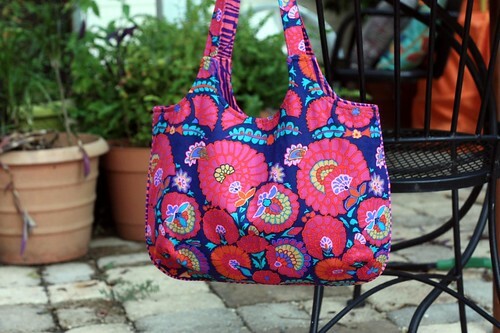 I thought about using the Ava Rose Tote pattern for Lily, but it wasn't big enough. She needs to carry her dance clothes + 3 pairs of dance shoes (women's size 8.5!! ), so I came up with something bigger. 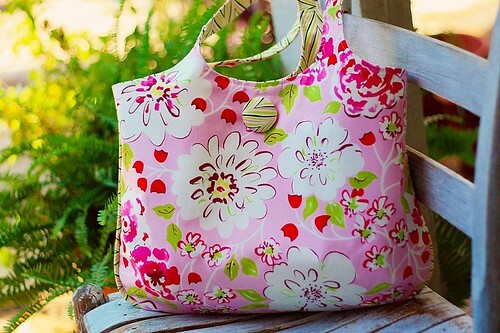 I like to think of this as the Ava Rose Tote's big sister (too bad I already named a bag after Lily). 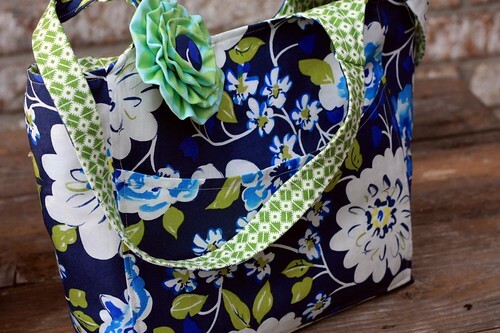 This bag is roomier, has a front pocket, and curved bottom corners. This is only the prototype, there are a few things that still need some tweaking. 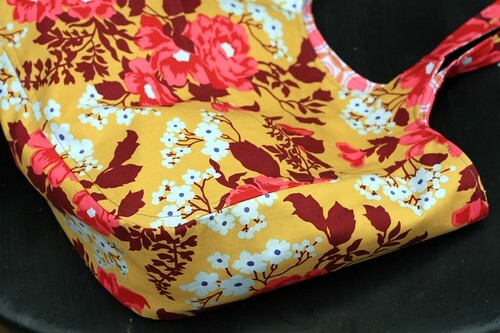 When I make Lily's bag, I plan to add 2 divided interior pockets for her to put her shoes, if she desires, though I'm sure she'll just throw it all in there! She likes the design and thinks that it will work out just fine. Now I need to find the perfect teal, purple, and lime green fabric (oh boy). 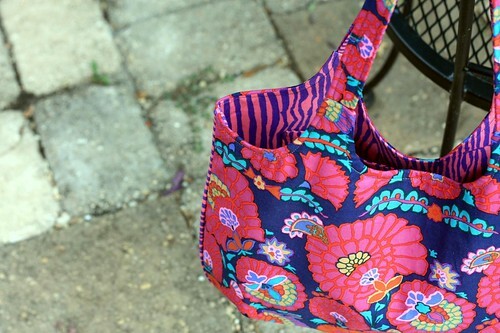 This next bag came to me a few weeks ago when I was working on that Round Yoke Tote, or maybe it was Pretty in Pleats. (What? You didn't think that I got ALL this accomplished in one weekend, did you? The bags I posted the other day were actually cut out and partially sewn weeks ago, but it took me until this past weekend to get them finished. I'm certainly no wonder woman!!) 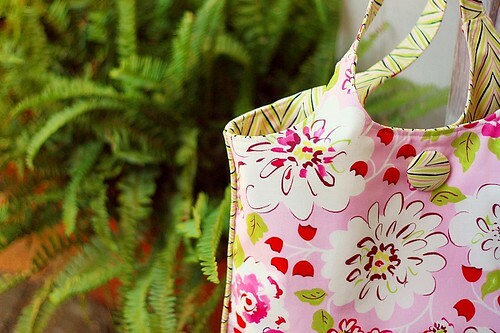 Gah, no matter, I got this idea in my head to make a simple bag with a shaped top. I love simple! This bag was so easy to put together!! A front & back, straps and lining. That's it. To give it some oomph, I added piping at the seam that matched the lining. With no naked piping on hand, I sewed a strip of fabric over some packaged piping that I had in my stash (an ugly color that I would probably never use). It's amazing how a little detail like that can a big difference. I still need to add some sort of closure, maybe a magnetic snap with a covered button (of course), but this was the prototype, so I wasn't so concerned with that. I honestly think this may be my go-to pattern when I want to make something up quick. I haven't decided if I'll turn these into official patterns, but it's a possibility. You see, I'm a little short on time these days, and probably will be for a while ;-) If these do become available in my shop, I'll be sure to let you know!! I'm still on a quest to make new samples of all my patterns. You can see my journey thus far here, here, here, and here. 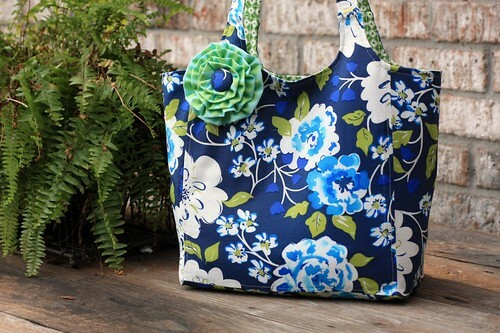 This time around I made the Round Yoke Handbag and another Ava Rose Tote. 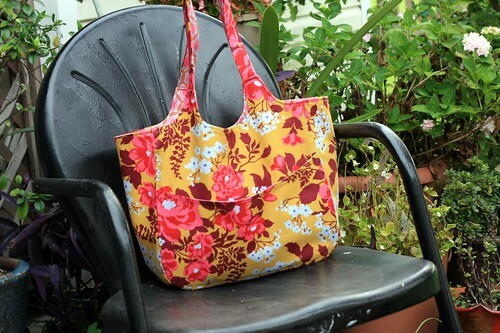 Yes, I know I just made an Ava Rose Tote, but I had to do it again. I've been using that bag since I made it and didn't think to take photos of it use for "official pattern purposes". 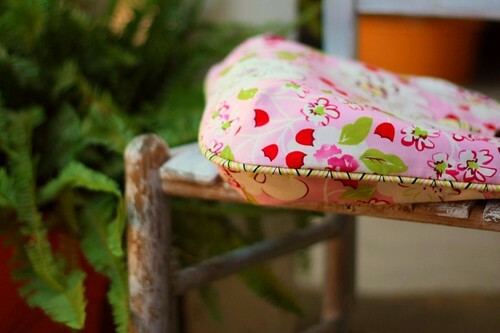 When making the Round Yoke bag, I decided to try it with canvas as interfacing, my latest favorite interfacing material. Eh, that was not the best choice. Lesson learned. When more structure is needed, canvas is not the best option. I guess I'll stick to Pellon #926 next time I make this one. Despite the limpness, I still think it turned out cute. That facric on the exterior is one of my favorites, and the covered buttons, well, you know I have a love for those! I'm sure once this bag gets filled with all the usual bag "stuff", it will be fine. I'm just super picky. Now this one, I knew I would love it. Blue has become one of my favorite colors lately, especially paired with green. Once I got it sewn up, I thought it needed a little punch, so flower brooch was added. I'm not fashion forward enough to carry off one of those babies on my clothes or in my hair, but I have no problem wearing one on a bag. Like my last one, I added a curved pocket on the front. It's the perfect pocket to hold a phone, keys, and a grocery list. With as much junk as I tote around in my bags, I love front pockets!! 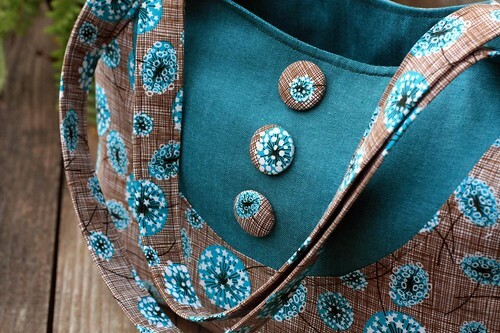 Front pockets, covered buttons, flower brooches, all this productivity got my wheels turning....(i'm not done yet!). It's funny how my energy comes in spurts these days. Most days I have absolutely no energy whatsoever, but others, I get into a bit of a frenzy. This weekend was one of those frenzy weekends. 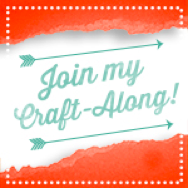 I think all my bottled up sewing wants got the better of me! First on the agenda was making a little something for a little friend who had her first birthday this weekend. Being the little sister of 3 older brothers, I knew it had to be something girlie. After a bit of digging in my stash, I settled on this pink and brown Amy Butler print. 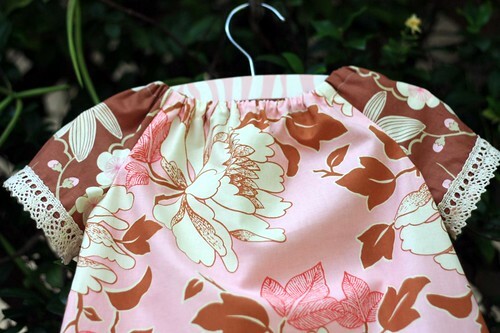 I decided to pair it with another AB print, brown on pink. 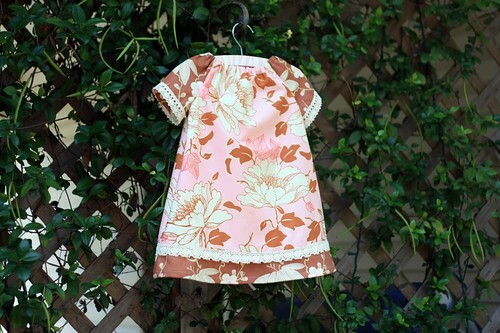 I used my go-to girl dress pattern, the chic-chic dress. Once the dress was made, it still needed a little something. 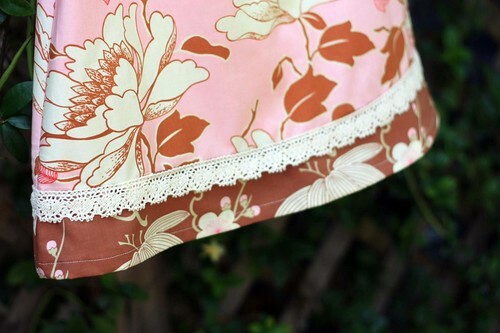 I happened to have some lace laying out from another project, which was perfect with the off-white in the prints. I love when things like that happen! 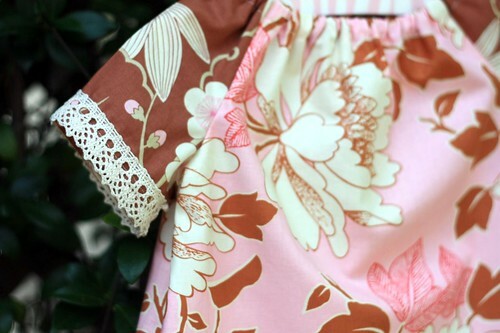 I added the lace to the hem first, then decided to add it to the sleeves. There wasn't quite enough of the lace to do the sleeves, so they're not the same, but I don't think it's noticeable. That just makes it more unique! Now that I'm back in the yarn mindset, I've been spending some time on Ravelry. My project page is a mess!! I've been trying to do a bit of cleaning up of my projects. My goodness, I sure have a lot of WIP's that I'll never get to. I even found a nearly completed project that I had totally forgotten about, even though I started working on it this past winter! 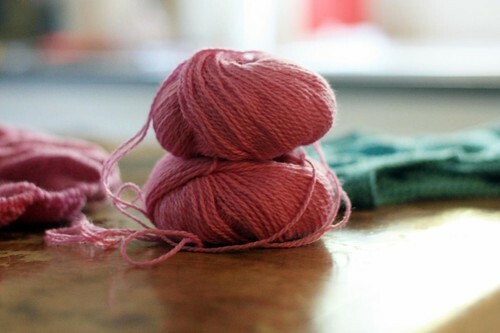 I think it's time to start frogging some of those WIP's to free up that yarn for new projects. I'm sure before it's all over there will be a middle sister version in the works as well. I wouldn't mind making a mama version, too. 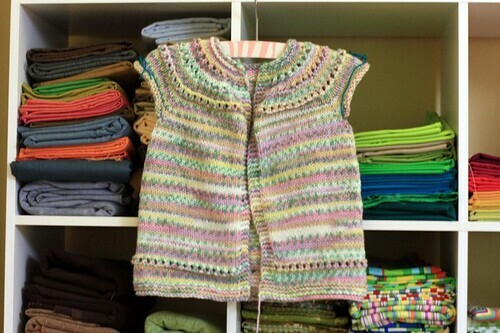 With a little frogging, I'm sure I have enough yarn on hand to outfit us all! Not a whole lot has been going on in my world lately. In fact, I make a point to do as little as possible. It's hot, I'm tired, enough said. The highlight of my weekend was making a big grocery shopping trip and getting all my laundry washed & folded (still waiting on the offspring to put their stacks away). I also scrubbed my sink making it gleaming white. See? not exactly blog-worthy. I thought many times about pulling out the sewing machine because I promised my girls new dance bags for the new year which starts on Monday, but that never happened....that darned buzzer on the dryer kept going off!! Also, I may have needed a nap or two. I'm bracing myself for the upcoming week...Monday is our first full week of school and after-school activities (dance class and soccer practice already!). Wish me luck, I'll need it. Ah life, you busy thing, you. Lots of new beginnings are happening around here. Yesterday my two big kids started a new school year - 5th for Lily and 2nd for Alex. Of course to them, it's old hat. New teachers, new classmates, new school supplies, too many forms for Mama to fill out (wait, they don't care about that last one)! Their first day went smoothly, there were no complaints about going back today. In fact, they both already have favorite teachers, and Alex told me that his teacher is the "best teacher in the whole wide world!". I suppose the bigger news is that today this little miss started kindergarten. She couldn't have been more excited about it. Getting her to bed last night was a challenge. She kept getting up asking questions about the big day. When we got to her classroom this morning, she didn't even think to tell us bye - that little stinker! With a quick reminder, she was all hugs and kisses, even if her big brother wasn't too keen on hugging his little sister in front of people (oh, the horror!). 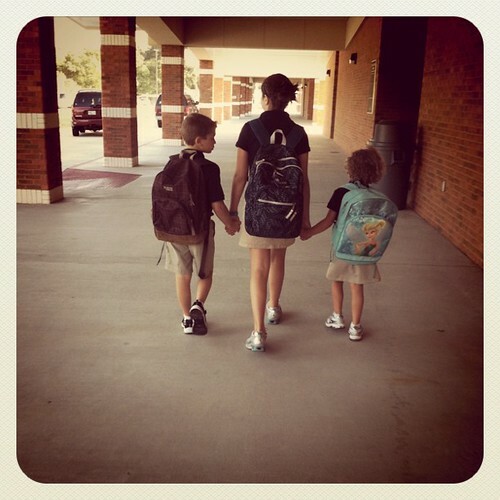 This is the one and only year that all 3 of my kids will be at the same school. Gosh, all three in school!! Where does the time go? I seem to have switched gears, from quilts to knitting. Suddenly last week I got the urge to knit. 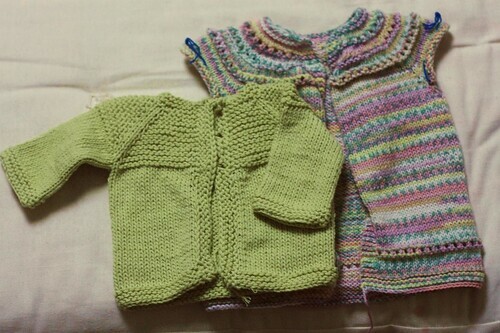 I haven't picked up my knitting needles since early June, leaving my poor little non-gendered baby sweater waiting for sleeves. With my desire to start something new, I finished up those sleeves as quickly as I could. I wish I could remember what yarn I used for this. I used every single bit of it. Actually, I was short, so I had to knit my second sleeve 2 rows shorter than the first, go back and rip back the first sleeve to make it 2 rows shorter, then use the left over yarn to finish the second. Yes, just barely enough. 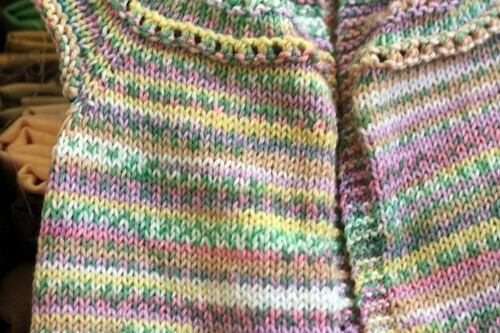 I still need to weave in the ends and add buttons. 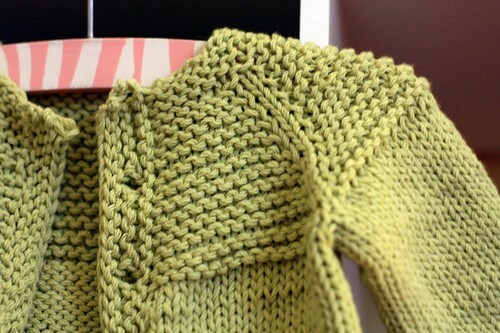 The pattern is the Garter Yoke Baby Cardi. 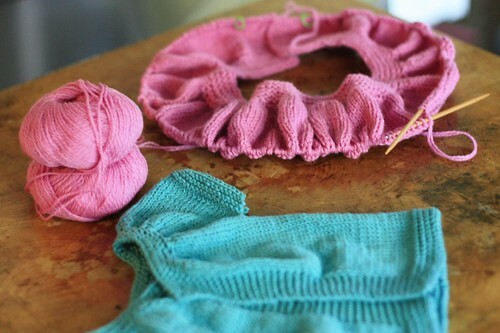 What I was eagerly itching to knit is the eyelet yoke baby sweater. I went to the yarn store with a pretty watermelon-ish deep pink in mind, but what I left with was this yarn that is supposed to mimic fair isle, Sirdar Crofter DK Fair Isle Effect Yarn. Pretty cool! I usually try to use natural fibers, but was surprised at how nice this felt. As you can see, I'm done with the body, but I don't think this will be worn for quite some time. 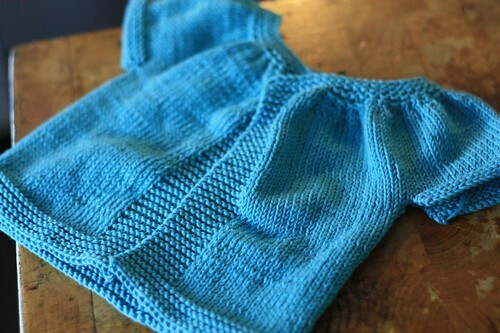 I knit the newborn size using a smaller needle than called for, but it looks like it would fit a toddler. Who am I kidding, it practically fits Ava!! Oh well, I'm sure it will be used eventually by my baby or given as a gift. I really like this pattern, so I'll probably give it another go, hopefully with smaller results. 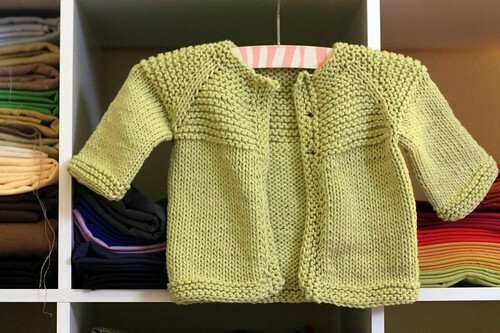 Next up is the Baby Kina Cardigan. Isn't this sweater sweet? I can't wait to make it. I had to use my French language skills to figure out what I was doing on the website, but the pattern itself is written in english. 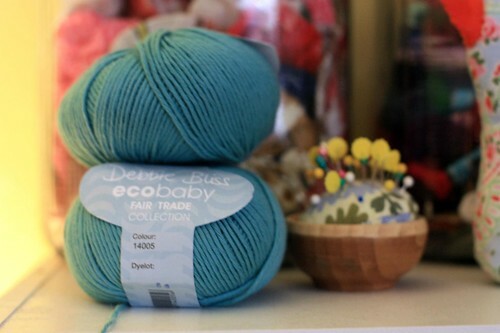 I'm going to knit it in the Debbi Bliss ecobaby, the yarn called for in the pattern. 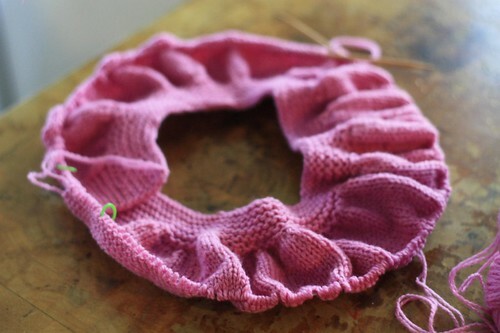 Now I'm debating whether to finish the sleeves on the Eyelet Yoke, or put it aside to dive into the Baby Kina. Ah, decisions, decisions...all made from the comfort of my sofa with the ac & celing fan on full blast!! Two much too long unfinished projects can be crossed off the list! Gosh, what a good feeling that is! Last night I finished sewing the binding on quilt #2 and gave them both a quick wash & dry. I love how crinkley and wrinkley quilts get after a pass through the washer & dryer. Here it is, quilt #1, started way back here. This quilt was started as a baby gift, but that little girl is now a toddler. I thought about scrapping it all together, but I made all the blocks with a specific person in mind, so I just had to finish it for that person. Using the blocks for anything else just didn't feel right. I do love this quilt. The pinks, reds, and greens are so soft and girly. I couldn't help but think about my own baby girl as I was finishing it up. I tend to choose more modern prints when I pick out fabrics, but most of these are based on vintage feed sacks. At the time, all these were pulled for my stash. This quilt makes me want to add a few more feed sack prints to my collection. And here's quilt #2 (another long ago project), started as a wedding gift for a friend who will celebrate her second anniversary this fall. Looking back, 2009 seems to be the year of quilts for me. Most of my UFO quilts are from then. I had all the gusto to start them, but little steam to finish it appears. With my friend in mind, I started all these blocks from my scrap basket, my favorite way to start a quilt. Once I got the middle scrappy part pieced, I added to each block fabrics from my stash that seemed to pull it all together. I really love how this turned out. Even Matt commented on it, which is a rare thing. I sure hope she likes it. With both these quilt I did simple straight line quilting. 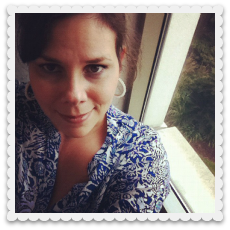 I am such an imperfect quilter, and that's quite alright with me. It's the freedom of piecing from scraps, the putting together of colors and patterns, and the evolution of an idea that l love about quilting - not perfectly straight lines and matching corners. I'm not sure that I'll ever be able to follow a proper quilt pattern, I'd much rather wing it and see what comes about.